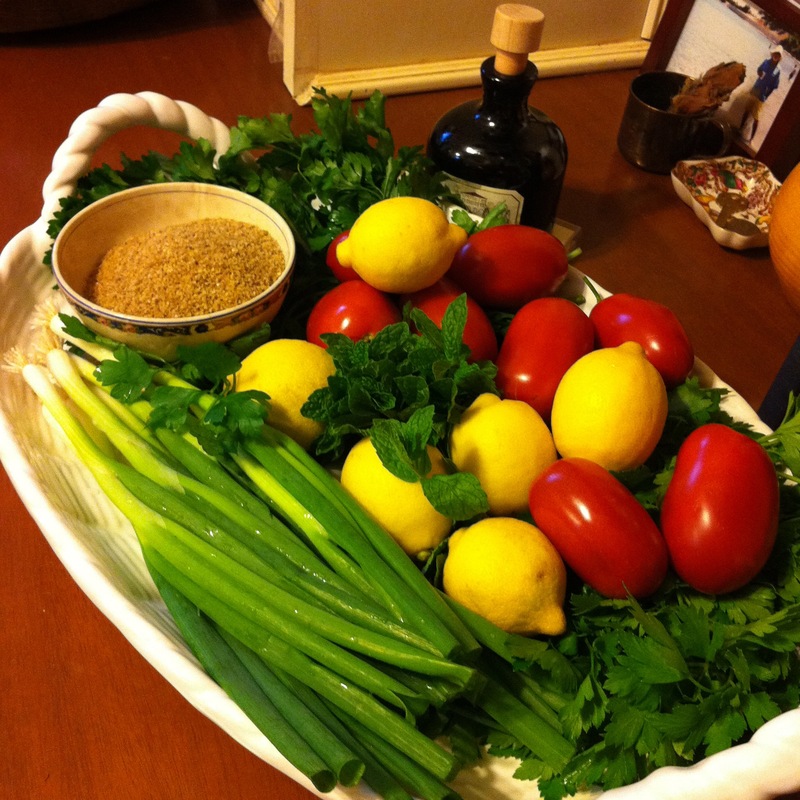 Here in sunny South Florida, tabbouleh is a salad prepared over and over when the temperature rises. It’s a year round, go to salad that is light and refreshing but with bulgur wheat as one of its main ingredients it’s substantial enough to act as a side AND as a vegetable. 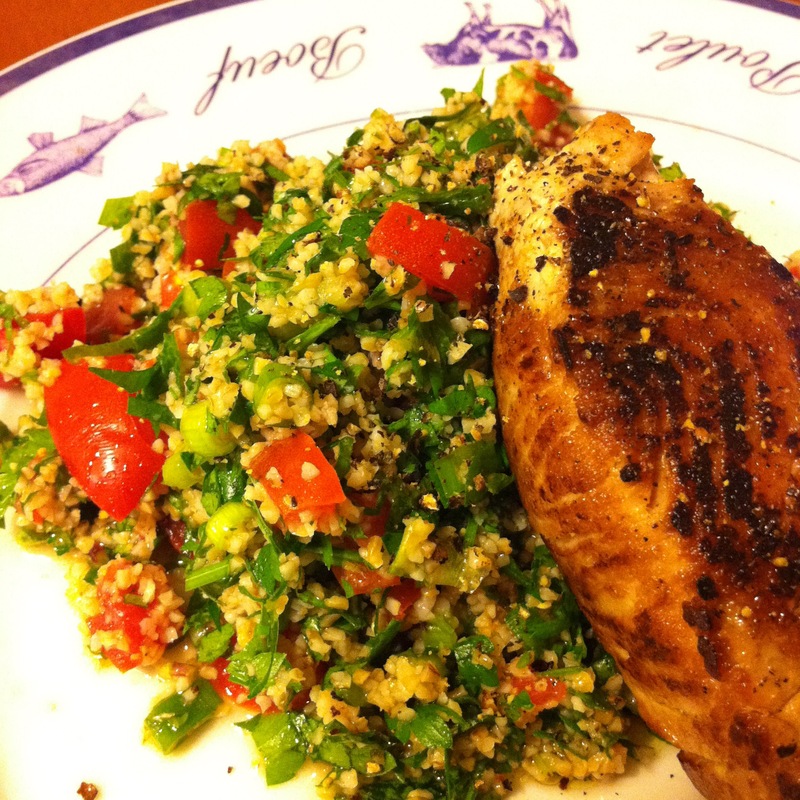 I make mine more Middle Eastern, that is with more parsley and mint than cracked wheat. Lots more. Lemon juice, olive oil, garlic and tomatoes unite the dish making it a tangy, garlicky joy. This salad is inexpensive and keeps well. We have it often with grilled chicken and fish. Last night we had it with grilled yellow fin tuna and it was fabulous. It pairs well with heavy meats, for instance lamb; the tartness of the lemons, tomatoes and parsley cutting through the richness. It can be served as an appetizer with toasted pita triangles to scoop it up and also as a sandwich stuffed in a halved pita. And last but not least, it’s pretty. Looks good, tastes good..it’s a win-win! 4 or 5 large garlic cloves, minced. I use a rasper. Combine bulgur, water, lemon juice and half the olive oil in a large, non-reactive bowl, I use glass. Mix well and set aside for 30 minutes at room temperature. Add the rest of the ingredients and toss well. Adjust seasonings to taste. Cover and let sit another 30 minutes until the flavors marry. We love eating this in the summer with tomatoes fresh from our garden; Farmer J. especially loves his juicy and well refrigerated! We call it “Safsouf”. Love your site!